When sportsmen think of South America, they typically envision shooting doves, pigeons and perdiz and perhaps fishing for dorado, but this past spring I enjoyed one of the best experiences of my life hunting California quail and fishing for hefty brown trout in Patagonia. I was with Patagonia River Guides near Trevelin (a two-hour flight from Buenos Aires), and we enjoyed running stylish English pointers in big open country, finding four to 10 coveys of 15 to 60 birds each per day. No one is exactly sure when and how California, or valley, quail were introduced to Patagonia, but they have adapted well and flourished in the central and northern parts of the region. We hunted huge estancias 30 minutes north of PRG’s main lodge. The area is arid high desert, with steep hills, deep ravines and rocky outcroppings. Vast valleys, pastures and hills of coirón grass are interspersed with impenetrable, thorny calafate thickets. Calafate berries are a favored quail food, as are maiten seeds, green sprouts and cardon seeds PRG guide Adolfo Alonso came up with the answer to rousting tight-holding quail from calafate thickets. He drops a few marble-size stones into a plastic bottle and screws the bottle to the top of an eight-foot cane pole, creating a giant rattle. 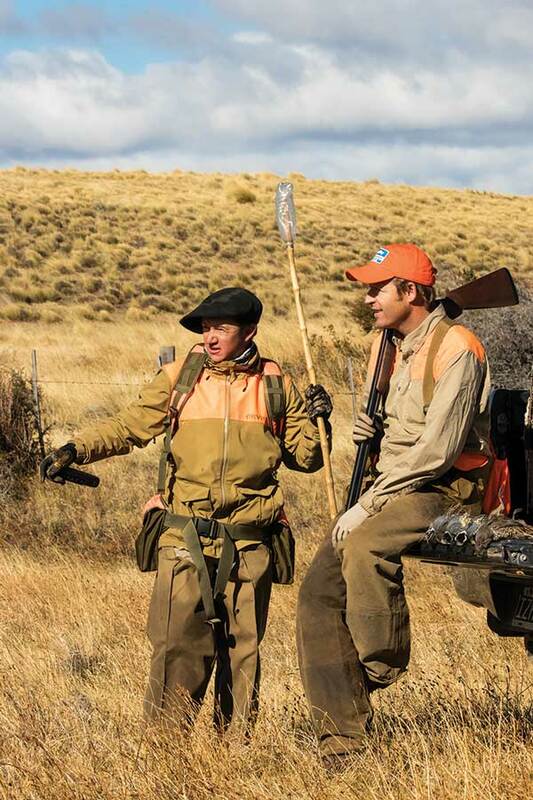 Once the dogs point and the hunters are positioned, the guide and bird boys poke and beat the brush with the “rattles,” encouraging the quail to flush. Four to eight coveys were moved per hunt. PRG owner Rance Rathie and Adolfo said that the severe 2016-’17 winter reduced covey sizes and overall bird numbers by 50 percent. 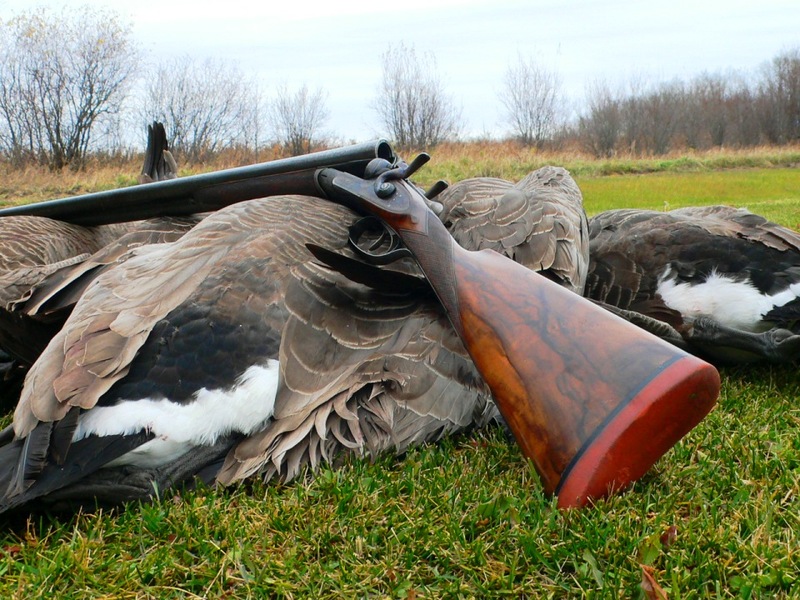 Despite that, many of the hunters in the lodge were able to harvest their 15-bird daily limits. PRG’s biddable English pointers rarely busted a bird and were retrieving machines. The shooting varied from easy open shots to tough snap-shooting on steep, unsteady terrain. Most shots were in the 15- to 25-yard range. The birds flushed mostly in staggered rises and flew low in all directions. This made knowing the locations of the dogs, guides and other hunters particularly important. Coveys of 15 to 60 quail were flushed using improvised “rattles” (above), and giant brown trout devoured streamers on unpressured rivers. One particularly memorable afternoon Paco, a stylish young pointer, slammed on point on the downwind side of a large calafate bush in an open field. PRG regular Ken Korth and I took advantage of the staggered 45-bird rise, with six birds falling to Ken’s gun and two to mine. The covey then set down on an open, grassy bench, and Paco pointed and retrieved six more singles as we filled our combined daily limit of 30 birds. Should one ever tire of bird hunting (is that possible? ), PRG’s trout fishing is incredible! It is reminiscent of Montana in the ’70s, when the rivers were desolate and the trout ate large dry flies with reckless abandon. 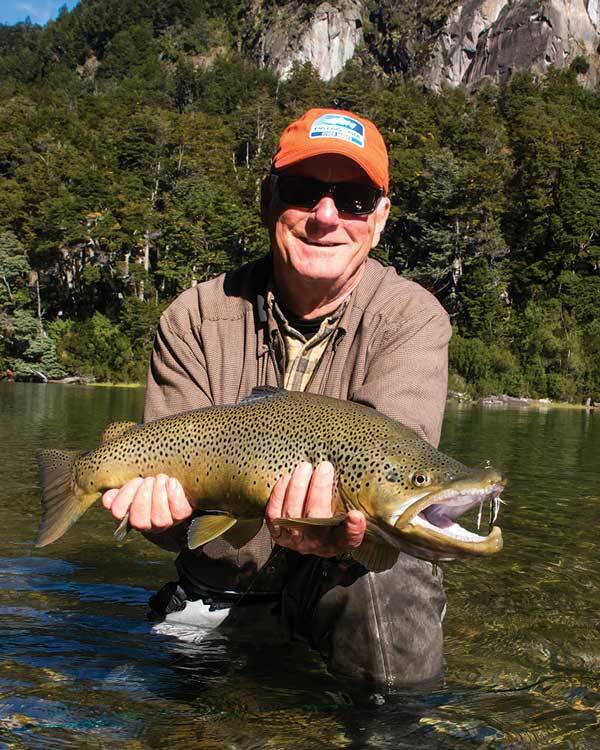 In Patagonia we fished rivers with streamers and private spring creeks with terrestrials. Brown, rainbow and brook trout 20 to 22 inches were caught daily, and 25- and 27-inch leviathan browns—my largest ever—were taken during the week. Lodging, food and libations take on another dimension at PRG. Hot lunches, fresh chilled salads, wonderful Argentine Malbec and cold beer are served in the field. Marvelous Argentine beef, chicken and pork, with veggies from PRG’s garden, are dinner staples. One evening we enjoyed a four-course asado (barbecue) of red stag, quail, prime rib and lamb. The lodge, rooms and cabins are comfortable and beautifully appointed, and there are two full bars—one of which has a pool table and Scotch bar as well as an adjacent wine cellar and cigar humidor. For more information, contact Patagonia River Guides. In Rock Island, Illinois, with paddle in hand.